Now in store and available!! Blending evolved piano technologies with extensive modern control, this next-generation instrument takes the industry-standard stage piano series to new levels of inspiration and creativity. As keys man and musical director for R&B legends Earth, Wind & Fire, Myron McKinley has a finely tuned ear for piano performance. In this video, Myron plays a jazz piece to demonstrate the stunning quality of the Roland RD-2000’s acoustic sounds, which have been customized to suit his taste. From the McKinley Martin Sydnor trio to the mighty Earth, Wind & Fire, Myron McKinley’s career has run the gamut of musical scenarios. But as the keys man reveals in this video interview, the Roland RD-2000 has the flexibility to adapt to every gig, offering authentic models of vintage acoustic/electric pianos, deep editing options that let him program custom sounds – and quickfire operation that means he can pull them up fast onstage. Via a second SuperNATURAL-based sound engine, the RD-2000 gives you access to a wide range of classic electric pianos from the ‘60s, ‘70s, and ‘80s. Included are newly developed recreations of the RD-1000 (the very first RD stage piano) and MKS-20 sound module from the 1980s. Driven by Roland’s milestone SA technology, their unique musical voices are instantly recognizable from that era’s hit records. Vintage effects are also on hand for processing your EPs, including the famous BOSS CE-1 Chorus and Roland SDD-320 Dimension D. Visit our special RD history page for more background on these and other classic instruments and effects, plus sound demos of the recreations found in the RD-2000. The PHA-50 progressive hammer-action keyboard with escapement is the ideal platform for playing the RD-2000’s responsive acoustic and electric pianos. This innovative keyboard features hybrid keys constructed of wood and molded materials, combining classic feel with rugged durability. Together with Roland’s advanced sensor mechanism and hammer-action design, the PHA-50 delivers authentic grand piano touch that’s right at home under your fingers. 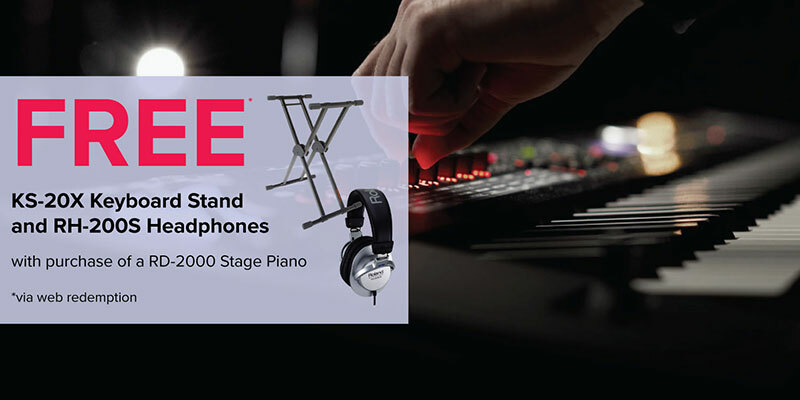 Purchase a Roland RD-2000 from an Authorised Australian Roland dealer, fill out the ‘Click to Apply’ form and receive a KS-20X Double Braced Keyboard Stand and a pair of RH-200S Headphones! Purchase must be made between 13th of March 2019 and 20th of April 2019. Terms and conditions apply, as per below.